Q Three queries from Frank McManus: "Is Glasgow the only city in Europe to have two teams playing in two European Finals in the same year ie 1967 Celtic v Inter Milan and Rangers v Bayern Munich?" A Glasgow isnt even the first let alone the only city to have two teams in European finals in the same year. In 1962 Atletico Madrid won the Cup-Winners Cup and Real lost in the European Cup Final. 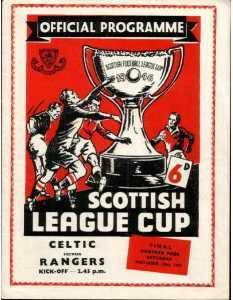 Next up were Celtic and Rangers in 1967. In 1985 Liverpool lost the European Cup Final following the Heysel tragedy and Everton won the Cup-Winners Cup. One year later and Madrid again had two Finalists, Real winning the UEFA Cup and Atletico losing in the CWC. Milan outdid everywhere else in 1994 when AC Milan won the European Cup and Inter triumphed in the UEFA Cup. Of course with only two trophies to contest nowadays it is a lot harder than ever for one city to provide two Finalists. Q "Is there a statue in Prague to a John Fadden or McFadden and was he of the famous "Scotch Professors?" A The player in question is John MADDEN, born in Dumbarton in 1865 and who died in Prague in 1948. He played for many clubs including Dumbarton, Celtic, Dundee, Tottenham Hotspur and Slavia Prague. He later coached the Czech club and they erected a statue to his memory. The 'Scotch Professors' is a term usually applied to Scottish players who headed to England in the late 19th century. As Madden played for just a season and a half in English football and no League games at all I would hesitate to apply that description to him. Q According to a Real Madrid website a John Fox Watson of Hamilton and Fulham FC played for Real Madrid in 1948 to 1949. Is this correct? Did he play for Hamilton Accies, and was he the only Scot ever to play for Real Madrid? A John Fox Watson is the full name of Jack Watson who was born in Hamilton on Hogmanay in 1917. He started out with local teams Waterthistle and Douglas Juniors then turned pro with Bury where he played a few games before World War Two. Post-war he joined Fulham then signed for Real Madrid in 1948-49 when they were coached by former Southampton and Fulham player Mike Keeping. By the start of 1949-50 he was back in the UK with Crystal Palace where he spent two seasons before dropping down to non-league level with Canterbury City. He died in 1976. I cant find any record of him playing for the Accies and cant say for sure that he was the only Scot to play for Real though there certainly cant have been many. Q John Anderson asks: "What was the date of the 5-1 defeat by England at Hampden, when Stewart Kennedy (I think) let in some of the softest goals I've ever seen (I'm older than I look, I promise!). I remember shivering away in despair, early on a cold night, so I think it was a midweek game?" A It was May 24th 1975 and while Kennedy was indeed the goalkeeper it was an absolutely horrific Saturday afternoon and it was at Wembley. Though it is perfectly understandable for you not to recall all the details! There was an horrific defeat by England at Hampden on a freezing cold night but it was Feb 14th 1973, the result was 5-0 and the keeper was Bobby Clark. Maybe John is doing the sensible thing and consolidating two nightmares into one! The SFA is constructing a Hall of Fame. Here's a few of the all-time greats we'd like to see in it. Q From Duncan McColl: "Has there been a Rangers or Celtic player scored a hat-trick in an Old Firm game?" A It's rare but it does happen. Ally McCoist was the last to do so in the 1983-84 League Cup Final and the last Celtic player was Stevie Chalmers in a League match in January 1966. Q Following on from that, 'Stuarty' asks: "Which Rangers or Celtic players have scored hat-ricks in Old Firm derbies and what dates?" A Answers on this site are based on the three recognised first class tournaments so there may have been others in the Glasgow Cup, Glasgow Charity Cup and various friendlies and testimonials but in League, Cup and League Cup there have been eleven hat-tricks. The first occasion was one of seven such instances in the League. John Barker of Rangers scored three in a 5-0 victory on September 2nd 1893. Bob Hamilton hit a treble for Rangers on January 2nd 1899 then Jimmy Quinn got in on the act for Celtic with the first Ne'erday hat-trick on January 1st 1912. Next wasn't until September 10th 1938 when Malcolm MacDonald did the business for Celtic. The first post-war hat-trick came from Jimmy Duncanson of Rangers on January 1st 1949 then Johnny Hubbard did likewise on January 1st 1955. As mentioned above, Stevie Chalmers hit the last League treble on January 3rd 1966. All these hat-tricks were scored at home and by a player from the winning team. All the Cup trebles have also been scored by the winning side and these have all taken place at Hampden. There have been three League Cup hat-tricks. McCoist's (see above) was in the 3-2 win on March 25th 1984. Billy McPhail scored three in the famous (or infamous, depending on how you look at it) 7-1 League Cup Final win of Celtic's on October 19th 1957. Celtic's Harry Hood also scored three in a Semi-Final tie on December 5th 1973 which Celtic won 3-1. The Scottish Cup has witnessed just one hat-trick but it couldn't have been more important. It was on April 16th 1904 in the first Final to be played at the present Hampden Park. Jimmy Quinn's treble gave Celtic the trophy by 3-2 and was the beginning of Rangers' fruitless 25-year long quest for victory in the Scottish Cup. Coupled with his later achievement in the League it earns Quinn the distinction of being the only player to score a hat-trick in an Old Firm match twice. South African Hubbard is the only non-Scot to score three in an Old Firm game. Q Bill Lowry wants to know: "Who was the first substitute to play in a Scottish League football match?" 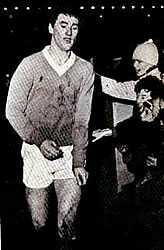 A It was Peter Conn of Queen's Park on Aug 23rd 1966 away to Albion Rovers. Substitutions had occurred earlier that season in the League Cup but this was the first in the League. Q Bryan McLean has some questions about goalscoring: "Who are the top ten all-time goalscorers in top division football in Scotland? Who are the top ten including European games? Who scored the most in a season in the top division?" Andy Cunningham:top scorer for Killie, Rangers and Scotland. Also the oldest debutant in England's top flight aged 38. Most in a season is MacFadyen with 52 for Motherwell in 1931-32. If you simply add goals scored in European matches to goals scored at top level then the only change in personnel is that Willie Wallace (Raith, Hearts, Celtic, Dumbarton) with 223 top level goals and 18 in Europe replaces Andy Cunningham. Additionally, McCoist's 21 European goals takes him above Reid. 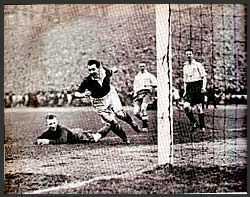 Bob Ferrier: One of four Motherwell players to feature in the all-time top ten scorers.